Dengan kuasa daripada Yesus Kristus, aku membaptis kamu dalam nama Bapa, dan Putera, dan Roh Kudus. Amin. Wednesday was a very good night. We went with a set of missionaries to a family that is going to be baptized this Saturday. We've been able to go several times to this family while the Elders teach. The lessons are all in Malay so we don't understand everything that is said, but we do feel the Spirit and sometimes we bare our testimonies in Malay. Tonight the husband and wife requested that Bapa (Malay for Father) baptize them. That would be me! I need to learn how to say the baptismal prayer in Malay by Saturday afternoon. Yes, the beginning of this blog is the baptismal prayer in Malay. After visiting with this family, we went with another set of Elders to visit a member family. A son is going back to school tomorrow in Kuching. His mother wanted him to have a blessing before he went. I had the privilege of being able to give that blessing. I knew it wasn't me giving the blessing. My speaking voice is different than the one I heard give the blessing. I was very blessed this evening to feel the Spirit and receive direction. Thursday afternoon we went with another set of Elders to a discussion with one of their investigators. The lesson was on the Plan of Salvation. We were able to bare our testimonies once again about the love our Father in Heaven has for His children. It is indeed a blessing to serve a mission as a senior couple. I wish more of our friends would make the decision to go on missions. They don't know what they're missing! My experiment in gardening did not do well, but if you leave well enough alone things can change. We have volunteer tomato plants coming up. I wonder how they will do in the heat and humidity here. We also had a "little" surprise in the backyard. We don't make it out there regularly, but this week we needed to empty some old water storage bottles. Some missionaries were helping us with this. While emptying the bottles, I discovered this little pineapple growing. It was actually drooping and looked really ripe so I picked it. It's only about four inches tall, but it looks good. We haven't had time to cut into. 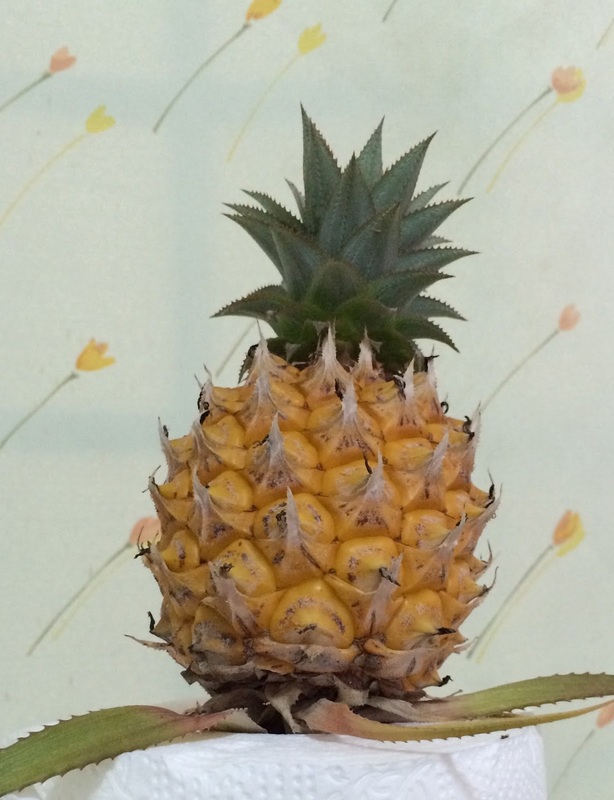 We didn't know we had a pineapple plant in the backyard. This week culminated with two awesome events. The first was "S" Day for the seminary students from Sibu and Sibu Jaya. 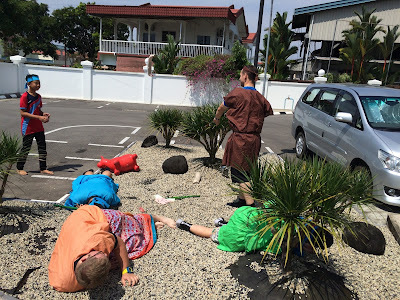 The event was produced by the young missionaries of the Sibu District, under the direction of our District Leader, Elder P. These young men portrayed several stories from the Book of Mormon. They involved the youth as well, having them portray characters in the stories. 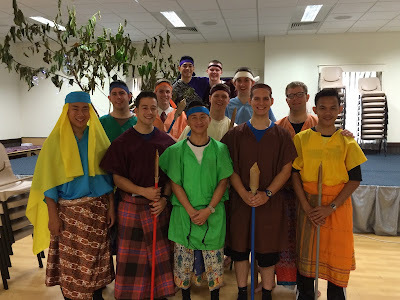 The stories included Nephi and his brothers obtaining the Brass Plates from Laban, Nephi building the ship to sail to their new world, the Prophet Abinadi, King Benjamin, The sons of Mosiah (including Ammon guarding King Lamoni's sheep and his "disarming" personality), and the coming of Christ to America. 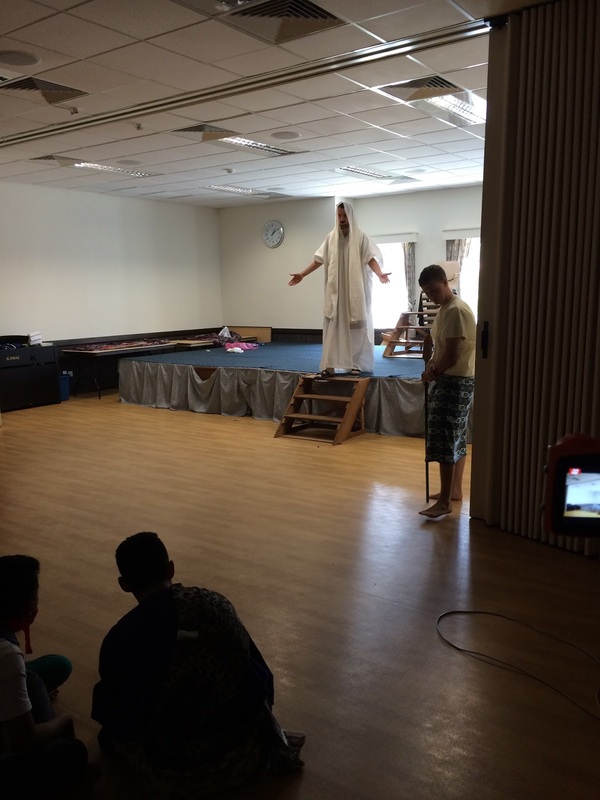 The youth really got into the stories and the activities that went along with it. 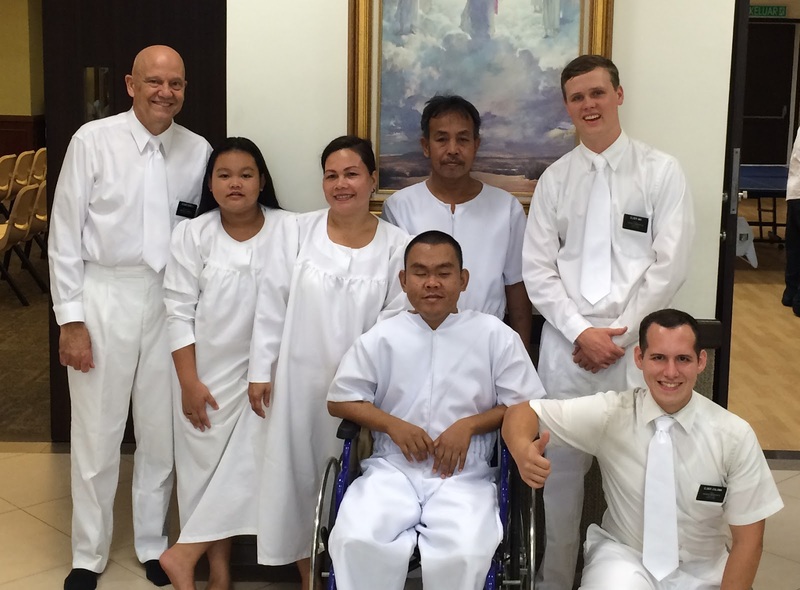 A perfect ending to the day was the baptism of Brother Gorka, Sister Bintang (Star), and two of their children. I had the privilege to baptize Brother Gorka and Sister Star. It was a beautiful service. They each bore their testimony after they were baptized. Such a beautiful Spirit was there. Tears flowed freely, especially when Jacky bore his testimony. He's 29 and has had diabetes since he was 16. This disease has cause many physical ailments including blindness and kidney failure, but that hasn't stopped him from learning and appreciating the Atonement of Jesus Christ. He also wants to learn how to play the piano. Sister Bodell has accepted the challenge to teach him. Sunday the family was confirmed members of The Church of Jesus Christ of Latter-day Saints. I had the privilege of confirming Brother Gorka. I am grateful for the Priesthood and the opportunity to use it to serve others. I know the Priesthood is the power and authority to act in behalf of our Father in Heaven and His Son, Jesus Christ. I know the Priesthood has been restored to the earth through the Prophet Joseph Smith. I am grateful that I can trace my Priesthood Line of Authority back to Jesus Christ. I am grateful that I know the Church is true. This was a great way to celebrate the Fourth of July weekend! Being here in Sibu has helped us appreciate the United States much more. Even though there are problems in the US, it could be a lot worse. So, happy Fourth of July to all of you! We appreciate what it means, and appreciate those who have fought for those ideals since our independence from England. May God bless America! What an example the two of you set!